I'm a big fan of Basic Grey Papers, so when I get a chance I enjoy playing in Scrap-Creations weekly Basic Grey Challenges. 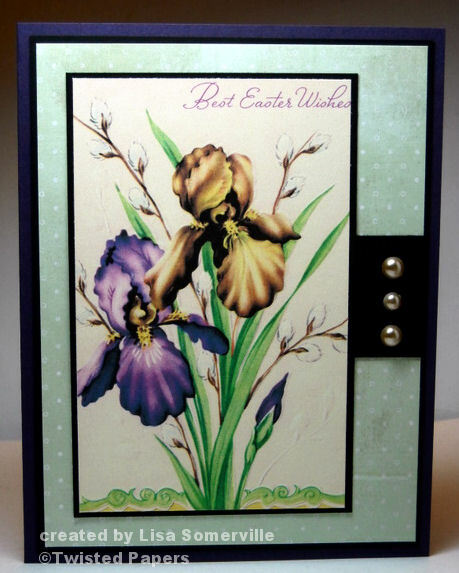 This weeks challenge is to create a Spring Themed card incorporating Basic Grey Papers. 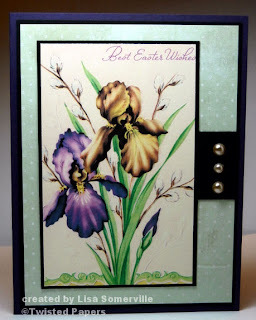 I just recently downloaded this beautiful Easter Iris from Twisted Papers - it's one of their FREE images in the March newsletter. I printed the image on Vanilla card stock, layered on a Black panel, then on a piece of Basic Grey Wisteria, and added a few Cream Half Pearls. A beautiful Easter card created in only minutes! What a way to go! Such a beautiful card! What a pretty card Lisa! SOLD! I am SOOOOOOOooo buying this image - all because of you! LOL TFS your gorgeous card! Gorgeous card and beautiful image. You created such a beautiful card without inking up as much as one finger! That image is so simple yet elegant, perfect on your card. Thanks so much for playing with us at Going Grey with Scrap-Creations. This card is stunning. You and gerri are killing me with these twisted papers. I am going to head over there and check them out. Great card. Thanls for playing.